This is highlighted by the highlighting of Ireland, Northern Ireland and Scotland in yellow in the image. 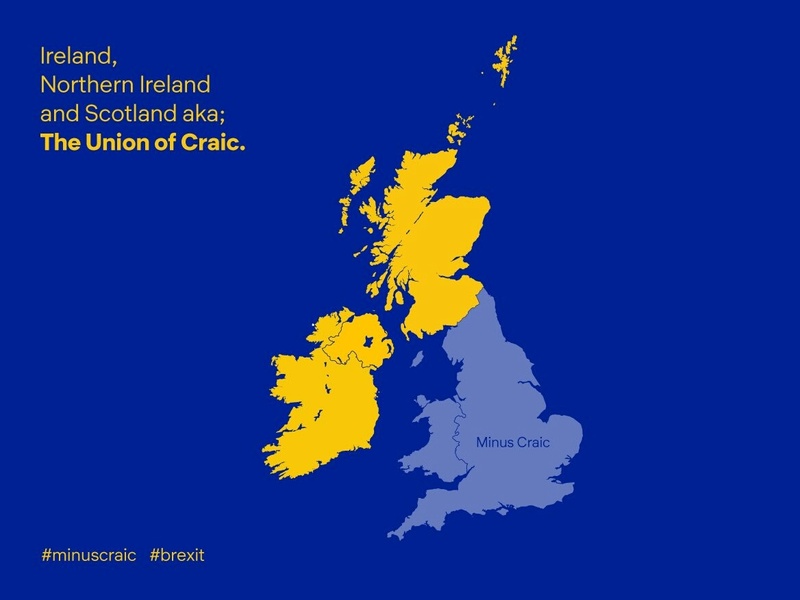 The Union of Craic sweeps from south to north and west to east, with Ulster clearly at its heart. The strategic centrality of Ulster to the political concerns of the British Isles did not always result in such hatred and internecine violence. Ulster was also a province filled with incongruous connections, local settlements and negotiated loyalties. Inishowen, for instance, was the site of a Protestant plantation under the stewardship of Arthur Chichester in the early seventeenth century. It saw the intrusion of Presbyterianism in the 1670s. Yet the Anglican rector in Clonmany parish from 1672 to 1711, Daniel McLaughlin was the brother of the Catholic priest, Peter, who had responsibility for the overlapping parish. The very fact that the province represented the narrow ground of the British political fault lines ensured that those who lived with the threat of earthquake oft entimes resolved to negotiate the fractured landscape with agility and guile. At first glance, John Toland fits with this profile of accomodatory aptitudes. By his own account he was born in Inishowen in 1669 or 1670. Quotes from Michael Brown (2011) A Political Biography of John Toland, Pickering & Chatto, pp. 21-22.